OPM is the exemplar of how our government deals with information security, or should I say doesn’t deal with it. Some will say that there are many mitigating circumstances like old systems that cannot be updated that caused much of the failures that lead to the OPM being compromised for over a year. However, the subsequent pivoting by the adversaries into many other networks we have not begun to even discuss as a nation yet because we are now media and governmentally fixated on the fact that the adversary had access to SF86 forms. Forms mind you that should be one of the better protected things out of all the possible things the government holds in it’s systems. So far the discourse in the media has been more sensationally oriented on the magic secret code names that the likes of Crowdstrike and Mandiant have come up with respectively for actors. Actors that they claim with varying vociferousness are in fact China whether it be the PLA (People’s Liberation Army) or the MSS (Ministry of State Security) though neither is accepting the pure hubris of all their press releases and anonymous or semi anonymous back-channel chats with the media in hopes of more attention. Whether or not these attacks were from China and their varying and vying espionage organs is rather irrelevant now and everyone needs to understand this. The cat is proverbially out of the bag here and by the cat slipping the bag, we now notice that the emperor who was holding that burlap sack of cat is in fact naked. 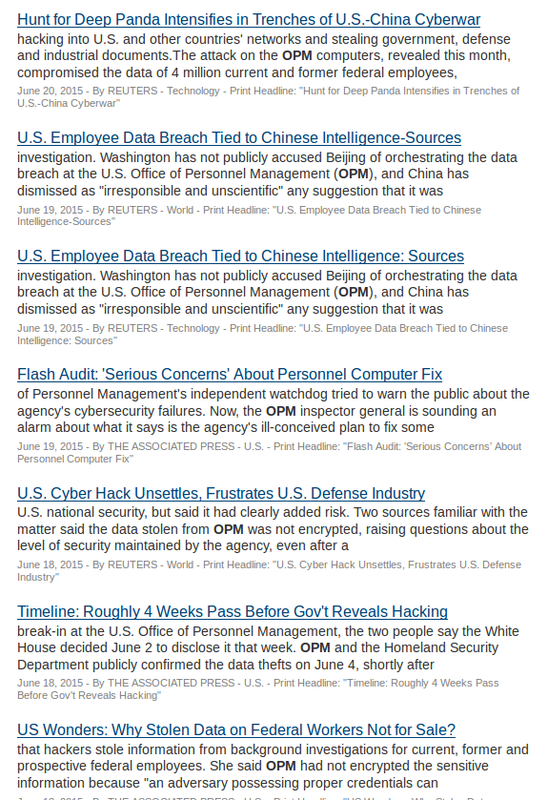 Or at least that should be the story here but as you can see from the stories filed above by the New York Times alone, the real attention seems to be on the fact that China is in fact hacking us. Well, I am sorry but I have news for you all, they have been hacking us for a long time now and doing very well at it. The primary reason for their being so able to steal us blind though is not as the media and the government and the Mandiant or Crowdstrike’s of the world would like you think. The APT (Advanced Persistent Threat) it seems, does not have to be advanced. They just need to be persistent and might I add patient. So when you read the headlines and the stories like those in the Times about the advanced malware called “Sakula” and how the tricksy Chinese have gotten administrator on OPM systems I cannot blame the uninitiated thinking that this is hard and that the Chinese actors are the equivalent of super villains hacking from beneath islands with skull faced volcano’s on them. After all, the media is teaching the people not in the know by these lede’s that computer security is unfathomable and hard. You know, like the comment by Archuleta in the Congressional hearing that “Security takes decades” No ma’am it doesn’t and as the congressman who yelled at you that day said, we don’t have decades. In fact, I would say that this game of Go is almost done and we aren’t winning. We have lost and the reasons we have lost are manifold but I would say that the root of it all is that we, America, have abdicated the notion of securing the things that we should have long ago. The excuses are many; because it would be costly, or hard, or perhaps more so due to government stagnation, self interest, and indolence. I know that the majority of the readers of my blog are in the security community but I wanted this post to reach across the void to the everyman on this matter. I exhort you to read the stories in the news and to take a step back. Consider the following statements and really understand where we are today. The OIG not only has been reporting on the OPM’s security issues but all of the governments. Go read the reports online for other orgs. You just have to Google for them and you will see over the years the same issues surfacing. OPM was told many times and with every report only minor changes were made. Money was not spent, people were not brought in, and all over networks that hold sensitive data. OPM was not practising security at a level commensurate with policies and procedures that were standard 20 years ago. OPM is part of a larger network of systems intergovernmentally. DOI (Dept of Interior) is one that I have had personal experince with. Insecurities abound. Since the hearings the President has made comment that he believes in Archuleta and she is keeping her job, though she has failed to make changers per OIG that have been pending for years. The argument that an adversary is advanced falls apart when the target is not following even the base security protocols that stop a user from using “password” as a password lord knows what else they weren’t doing. Brass tacks, we deserved to be hacked. So gentle reader, consider what I have told you here. The government is not protecting OUR data commensurate with the security requirements we would demand of a company that holds it like say Target. It’s time to hold the government to the standards that they would like to enforce on companies. Let’s not listen to the marketing leaks by Mandiant and Crowdstrike about the actors and who they may be. What matters is that the data was taken and the reason it was taken was because of poor security and bad management on the part of the federal government. You know, those guys rattling the cyber war sabre lately. « OPM: WHO? WHY? WHAT? ERMEGERD CHINA! Heh, defender, got a front row seat.